An estimated one million Internet users are expected to have trouble connecting to some of their favorite Websites during World IPv6 Day on Wednesday. More than 400 popular Websites including Facebook, Google, Yahoo and Bing are participating in a test run of a new addressing system for the Internet, called Internet Protocol version 6 (IPv6). The problem is that a relatively small number of people, about 0.03-0.05 percent of worldwide Internet users, may experience a problem called IPv6 brokenness. This basically means that if you're computer is on a network participating in the IPv6 test Wednesday, there may be a problem somewhere between your computer and your connection to the Internet. But along with a limited number of IPv6 problems, there will also be the usual computer annoyances such as downed Internet connections, slow response times from your ISP, Website problems, Wi-Fi connectivity issues and so on. So how do you know what kind of a problem you're having? Here's a quick rundown of how you can test for problems. Whenever you type a URL such as Google.com into your browser, that address is converted into a series of machine-readable numbers called an Internet Protocol (IP) address. IP addresses (IPv4) currently look like something like this: 70.42.185.10 (one of Google's many IP addresses). The problem is the IPv4 address space will run out later this year, which could cause limited functionality and other problems later on down the road. To solve this problem, the Internet has to move to IPv6, which has an address space that is four billion times bigger than IPv4. Long form IPv6 addresses look like this: 2620:0000:0e50:0002:0000:0000:0000:0001. 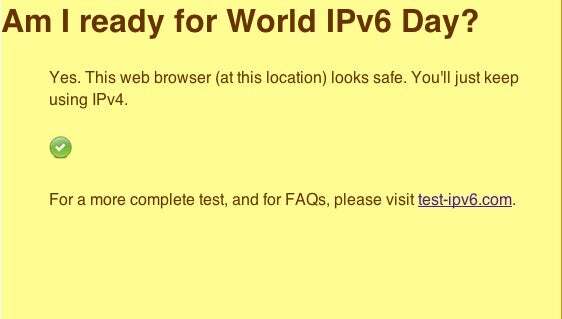 There are two sites that can let you know if you can expect to experience problems during IPv6 Day. If you just want to know whether you should expect to see any hassles on your current network Wednesday, visit omgipv6day.com. This site will just give you a simple checkmark if your connection looks clear for IPv6 Day browsing. To see something a little more detailed, check out test-ipv6.com. This site not only tells you whether you are can expect problems during the IPv6 test run, but also rates your Internet connection to see whether your ISP is ready for IPv6 connectivity. You can also view detailed technical data explaining each test the site runs to test your IPv6 capabilities. If you are having IPv6 problems you can check out this IPv6 FAQ to try and fix it. My connection failed IPv6 connectivity scoring 0/10, but that's not a critical problem right now as IPv4 is still the standard way to connect to the Internet. Both IPv6 test sites are personal websites run by Jason Feeler, an independent software developer and a consultant for Yahoo. Keep in mind that if you are moving between different Wi-Fi connections today your IPv6 status may change. If IPv6 Day isn't your problem, but you can still get online then your best bet is to check whether you're having a connection problem or the site you're looking for has crashed. The easy way to do that is to visit isup.me. Let's say you're having problems connecting to Facebook. Just type Facebook.com into the site's search bar and hit return. The service will ping the site you're looking for and let you know whether Facebook is up or if it's just you having the problem. Chances are it's just you, but you never know. If it is you, try restarting your browser or clearing your browser's cache and try again. If the site's up and you're not having IPv6 problems then you can try the usual connectivity problem solvers such as restarting your computer, restarting your wireless router, or calling your service provider to see if your connection is down. Want to know more about IPv6 ? Check out PCWorld's "10 Things To Know About The Move To IPv6."